“Frater's Thicket: A Model of Thought” from Christian Faith Publishing author Randy Landes is an eye-opening guide to The Bible’s connection to mental health and how to improve it through the Lord. “Frater's Thicket: A Model of Thought”: an elaboration of basic biblical concepts applied to the model of thought used by the author, is an enlightening framework to develop mentally with the guidance of God. “Frater's Thicket: A Model of Thought” is the creation of published author, Randy Landes, Licensed Independent Clinical Social Worker (LICSW) and a Certified Advanced Alcohol and Drug Counselor (AADC). Landes has a Master’s Degree in Social Work. “[My] ministerial experience is less than orthodox as [my] early experience with the Christian community created a personal curiosity about what God has to say about the family and about man’s mental health in general. God’s answer to this curiosity has been the journey of a Christian walking through the secular world of the mental health profession with a Bible in [my] hand as a guide. A journey unusual, but a faith no less traditional than our forefathers,” said Landes. Published by Christian Faith Publishing, Randy Landes’ new book is a trailblazing work to be applied to everyday life. Serving as a self-help and/or instructional book, “Frater's Thicket: A Model of Thought” is intended to broaden the understanding of thought, the mind and God’s intentions for their use. 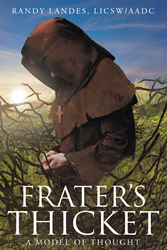 View a synopsis of “Frater's Thicket: A Model of Thought” on YouTube. Consumers can purchase“Frater's Thicket: A Model of Thought” at traditional brick & mortar bookstores, or online at Amazon.com, Apple iTunes store, Kobo or Barnes and Noble. For additional information or inquiries about “Frater's Thicket: A Model of Thought”, contact the Christian Faith Publishing media department at 866-554-0919.